Throughout the years, Garmin has continually been a leader in GPS technology. Each year the company improves its navigation systems by making them smaller and more portable, as well as increasing performance. So, when I recently received a nüvi 1350 to review, I could not wait to try it out. Although the nüvi 1350 was released last year and now is a little outdated, it is nonetheless an excellent Garmin product. As the specifications state, this nüvi has a 4.3” widescreen display, which is smaller than the average 7” built-in GPS, and weighs only 5.7 ounces. I recommend setting up the unit on the left side of the windshield, since this made the nüvi look as inconspicuous as possible. This compact size means that the nüvi 1350 conveniently fits into one’s palm, pocket, or purse, and makes it very easy to use the unit while on foot outside of a vehicle. The button layout was simple, something that I greatly appreciated because of how easy it made the unit to use. 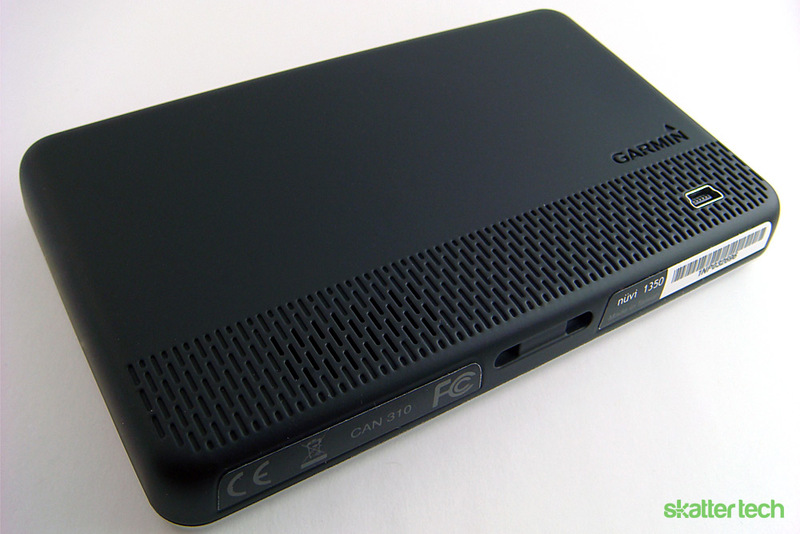 There are only 4 external portions: a power button located on top, miniUSB and speakers on the back, and a microSD card slot on the left side. 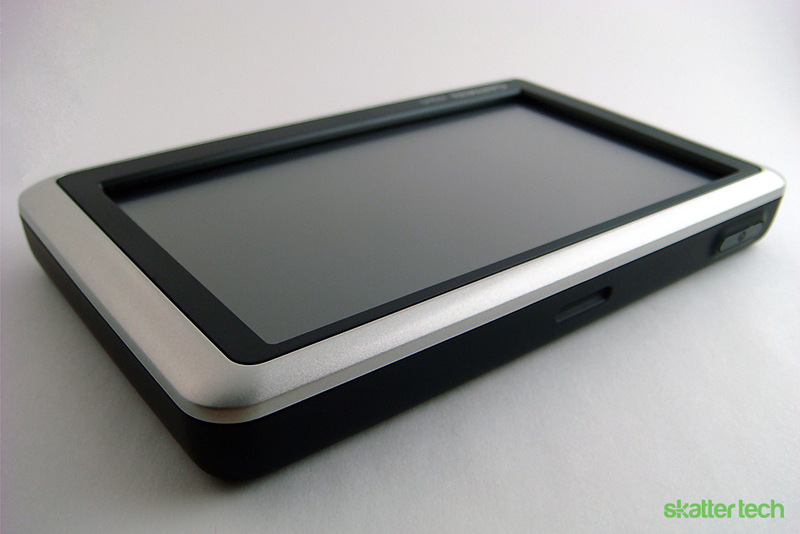 Additionally, rubberized material covers the entire backside of the unit to prevent it from slipping from one’s hands. All in all, I did not find any issues with the body. If a simplistic, easy-to-use design is important to you, then the nüvi 1350 hits all the marks. I was surprised to find only a few functions on the nüvi’s home screen. The top bar of the screen shows the satellite signal strength, the time, and the battery life. There are four buttons in the middle and bottom: “Where to?” “View Map,” “Volume,” and “Tools.” These are spaced out nicely on the widescreen display, which prevents you from accidentally hitting a wrong button. It might appear cumbersome going through all the different sub-menus, such as getting from settings to the map, but fortunately each page includes a back arrow that returns you to the previous menu. I really liked this uncluttered layout, since my previous GPS unit had an entire menu pop up on the home screen with buttons for everything from directions to settings, which was annoying at times. For instance, to get from the settings to the directions would take me about six touches on my previous unit; on the nüvi, though, it only took about two or three touches, which saved a lot of time and frustration. Like with the body, I did not find any problems with the display and menu. I felt very comfortable using this unit because of the simple, easy-to-use interface. I had no trouble just picking up the nüvi and navigating right away. Navigation is obviously extremely important for a GPS unit. Once the nüvi gets turned on, it automatically attempts to acquire a link to satellites. Like most GPS units, the nüvi works best out in an open area away from tall buildings and anything that may physically block it from finding a signal with its antenna. Hence, using the nüvi on a car seat or in a closed area such as a tunnel makes it more difficult for it to acquire a satellite and get a good link. After moving into the “Where to?” menu, the user can then search for a destination using various methods, such as inputting the address directly, searching by intersection, or performing a broad search for points of interests. I was especially pleased that Garmin included a “Home” option that allows users to automatically save their permanent address so they do not have to enter it each time they want to go home. It is important to note that the nüvi comes preloaded with around 6 million points of interests. Since new buildings and businesses are constructed or demolished every day, it’s important for users to update the nüvi via a computer (through USB) or a SD card whenever new maps are released. Once a destination is chosen, the nüvi calculates the directions, distance, and estimated arrival time and highlights the route to take in purple. Using the satellite link, it also finds the vehicle’s speed and the street’s speed limit (if posted). If the driver goes above the speed limit, the nüvi highlights the current speed in red. The unit provides voice-prompted, turn-by-turn directions to the driver as well. This feature is paired with lane assist, which informs the user when to make the correct turn, and makes it difficult to get lost while driving. Should the user miss a turn or take an incorrect street, the nüvi immediately adjusts and recalculates a new set of directions. I did have some minor issues with these features. For one thing, I found that the map sometimes felt too cluttered. For instance, displaying the speed limit felt unnecessary. All streets have posted or implied (ex. residential areas) speed limits, so it just seems redundant to include this piece of information. According to other user testimonials, the unit’s displayed speed limits are higher than the actual speed limits. This misinformation apparently affects the calculated arrival time as well, but I cannot confirm this experience. Calculating the car’s speed seemed nonessential as well, considering all vehicles come with a speedometer. In addition to lane assist, it would have been beneficial to drivers if this model had come with the junction view feature. Junction view provides a first person view of the street, which makes it easier to take the right turn at a fork or junction in the road. The highlight on a route can actually obscure the proper turn as well. Despite these fallbacks, I could still navigate and drive to my destination guided by the GPS without any confusion. I am amazed by the amount of information that users can store in a Garmin unit. The nüvi 1350 comes preloaded with maps of the United States and Canada. Additionally, users can download maps for Mexico, Europe, Asia, Africa, Australia, Middle East, and Malaysia. Other types of maps include water (for lakes) and topography (for trails). This is very convenient, and means that a user who wants to go to Lake Superior or go backpacking in the UK can download these maps and be ready to go in a flash. These maps do cost upwards of $100 each. However, it might be worth the convenience of not getting lost in the hills of Asia or wherever you’re vacationing. The nüvi 1350 supports “enhanced pedestrian mode” which gives information on local public transit such as bus lines, subways, trams, and other transportation. The GPS will tell the user where to go as well as how long it will take to get there. Overall, I am impressed with all of this information, although the price does feel a bit high. While these downloadable maps would be great for tourists who aren’t technologically inclined, any user with minimal computer experience can look up destinations, directions, and available transportation beforehand on the internet for free. 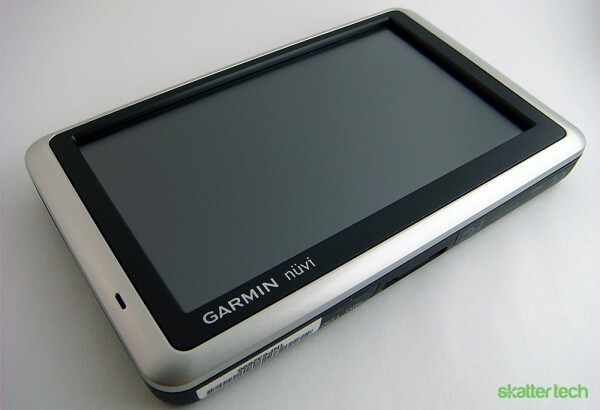 In addition to providing directions, the nüvi comes with a few other useful applications, including ecoRoute, Garmin Connect, Garmin Lock, and the emergency locator. Out of all of these, I enjoyed using ecoRoute the most. This feature, found under “Tools,” estimates the vehicle’s fuel economy and fuel price for driving to a destination from inputted data. For example, say I wanted to go to the Golden Gate Bridge from San Jose; the ecoRoute feature tells me exactly how much money the trip will cost in terms of gas. The feature also provides tools to improve fuel efficiency, such as the “Driving Challenge”, which score a driver’s habits. The nüvi gives you positive points for gradually speeding up and negates points if the driver accelerates quickly. Whenever I turned on this challenge, I drove more conservatively because I wanted to rack up points and save gas, which ended up saving me money. Other features include Garmin Connect, which allows users to upload geo-tagged photos on Garmin’s website. Nüvi owners can download these photos onto the device and navigate to them. This might help users navigate to a destination in instances where they’ve forgotten the name of the place but can recognize it in a picture. Also, in case someone wants to keep their destinations private or safe, they can use Garmin Lock to create a password for their unit. Unfortunately, the only way to reset the password if you get forget it or the unit gets stolen is to send the unit back to Garmin with the proof of purchase or valid registration. I do not think this feature deters thieves per se, but I strongly urge all those with a Garmin to use this feature. This way, if your unit does end up stolen, your home address and destinations will remain securely hidden. Another notable feature is the emergency locator, which finds the user’s location, provides the current coordinates (longitude/latitude), gives the nearest address and intersection, and brings up the nearest hospital, police services, and gas station so that the user can get help quickly. Other tools in the nüvi include a currency and unit converter, calculator, world clock, and JPEG picture viewer. All in all, because of the abundance of useful, practical, and innovative features that come with the nüvi, I gave this section a full five star rating. Even though other Garmin units have been issued since its release last year, the nüvi 1350 is still an affordable and practical GPS unit. The portable size, bright display, functionality, and friendly user interface all add to this device’s appeal. The unit, despite the small dimensions, packs a big punch with its sheer amount of features and map information. Even with the minor issues I faced with the display and map prices, I was very pleased with this device and would recommend it to both the light and heavy traveler. It has more than enough features for both types of users, as well of plenty of extra downloadable content. Love garmin`s friendly user interface !